this is the most incredible oatmeal you’ll ever have. Pour oats, chia seeds and water into a large saucepan. Bring to a boil, then reduce to a simmer for about 5 minutes, stirring frequently, until oats are soft. Remove from heat and stir in cinnamon, vanilla extract, salt, peanut butter, milk and maple syrup until combined. In a medium skillet, melt butter and brown sugar at medium-high heat. Add sliced bananas and cook 1-2 minutes per side, until browned, flipping once. 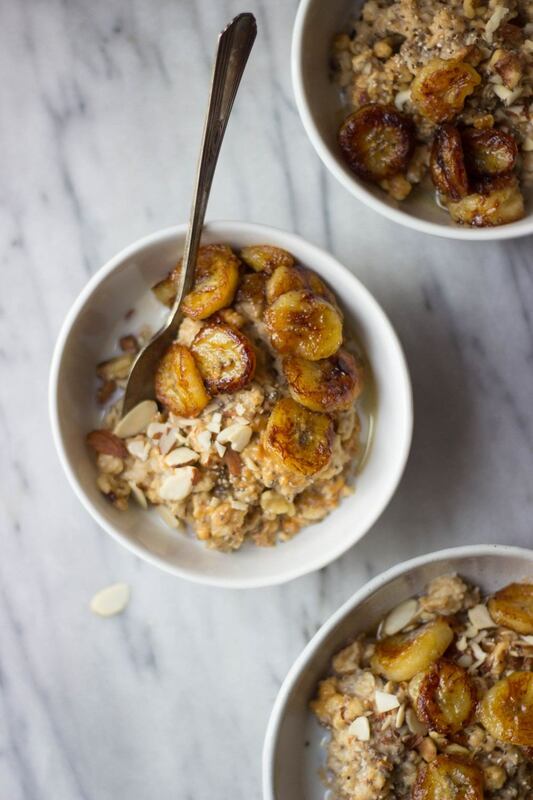 Scoop oatmeal into bowls and top with milk and maple syrup, as desired, and walnuts/almonds and caramelized bananas.